This post is my salute to the éclair – the stunning, wicked treats found in most French pastry shops which by their very nature capture everyone’s steal hearts. By definition, an éclair is a finger-shaped pastry made with choux dough, filled with cream or custard and topped with icing. It’s no exaggeration to say that they look like art and taste like heaven – something achieved with patience, precision and care. I was once told that baking is all about precision; I was in denial about this, but every day I find another reason to believe that, in baking, every little detail matters. I am not going to lie – unless you’re a natural baker, making éclairs is not something you will nail the first time. My first attempt at making éclairs a few months ago was hilariously tragic (you don’t want to know what actually happened, trust me). Even with all the learnings I gained from that experience, I still find process of making éclairs very challenging. But, stop and think for a second about how much you want your homemade éclair to taste as great as an authentic French one. That fire you feel – that’s how hard you would want to try making it. Pay attention to all the instructions given, and the end result is going to reward your hard work. This lemon curd meringue éclair is what happened when I took the typically rich taste and feel of an eclair and gave it a summer twist. 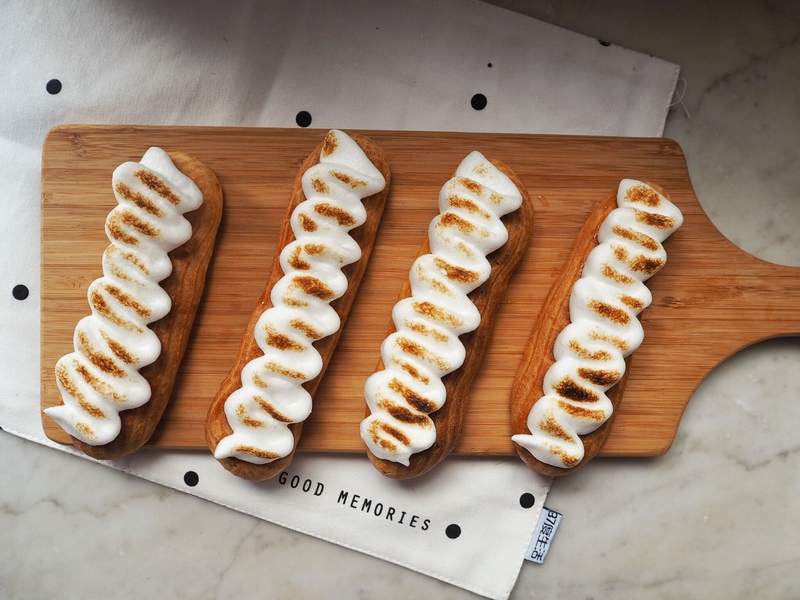 With airy meringue, delicate choux and smooth lemon curd cream, every bite of this éclair is as light as can be. That doesn’t mean the classic rich flavour is gone, but it does mean that you can have one, two, or three of them without noticing. The recipe I used for the choux pastry is byTopless Baker, who made a bunch of delicious yet uncomplicated nutella éclair in his video. His on-screen presence is always so uplifting & encouraging that every time after I watch his videos I’d believe I can master anything I want. I admire him so much, to an extent that I’ve made a little promise to myself – one day I will be a successful pastry chef, who is lucky enough to meet him in person, and we will spend days and days testing out different recipes …. *come back* Okay, so, dear readers, get moving and conquer these little monsters for yourself now! Preheat oven to 425F/ 220°C. Line 1 large baking tray with baking paper. Combine butter, water, milk, salt and sugar in a saucepan over medium heat. Cook for 3 to 4 minutes or the butter melts and the mixture just starts to boil. Reduce heat to low. Add bread flour. Stir vigorously the mixture with a wooden spoon for 3 minutes or until mixture comes together as a ball. There’ll will be a film forming at the bottom of the pan. Remove from heat and set aside for 5 minutes to cool slightly. Beat in eggs, one at a time, until well combined and mixture forms a glossy dough. Spoon dough into a piping bag fitted with a star tip. Pipe 12-inch long logs, 2-inch apart, onto the prepared tray. Put the tray into the freezer for at least an hour. When the choux pastry is completely chilled and hard, cut them with a sharp knife into 6-inch equal logs. Space them well on the baking tray as they rise a lot in the oven. Bake at 425F/ 220°C for 20 mins. Reduce the temperature to 350F/180°C and bake for 25 mins until the éclairs rise fully and turn golden brown. Within these 45 mins, do NOT open the oven door at all or the éclairs will collapse. Further reduce the temperature to 300F/150°C; then, take out the éclairs with your heatproof oven glove, and make a slit or poke a small hole on the side of the eclair shells for the steam to escape and continue to dry off the éclairs in the oven for 15 mins. Remove the éclairs from the oven, and let them cool completely on a wire rack. Pour heavy whipping cream into a mixing bowl. Using an electric mixer on high speed, whip the cream until soft peaks form. Gently fold in lemon curd until incorporated. Transfer the cream into a pastry bag tipped with a filling tip. In another bowl (make sure it’s oil free), add egg whites, cream of tar tar, and salt. Using an electric mixer, beat the egg whites at high speed until foamy. Gradually add the caster sugar using a tablespoon, and beat until thick and glossy. This will take about 5-7 mins. Gently fold in limoncello. Transfer the meringue into a pastry bag tipped with a big rose tip. Poke three holes with the filling tip and pipe the lemon curd cream into each éclair until fully filled inside. Pipe the meringue on top of each éclair, slightly toast the meringue using a blowtorch. If not served immediately, these éclairs should be kept in refrigerator. This is such a cool idea for an eclair! I’ll definitely have to add it to my list of things to try out. Yeappp!!! Eclair is such a tricky dessert and I am still trying to master the techniques. Thank you again! I’ll keep it up :)) Next thing to try is macaron… hope I can do it haha.